I enjoy reading aloud. Depending on the subject matter. I inadvertently obtained a copy of The Book Of Guys in the mid-90s and devoured it. I have since read aloud the preface and “Lonesome Shorty” more times than I can recall. I have read and re-read the book cover to cover on an “as-needed” basis. It's “needed” more often than you might imagine. This is side-splittingly funny stuff, sometimes not exactly in the “HAHA” way, but in the “HolyCrap” manner. This guy Keillor knows my life experience. I have purchased more copies of this book whenever the need arose. 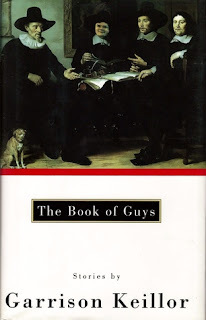 Whenever I meet a man (of my generation in particular—Boomers) who has come to the conclusion that women simply cannot be understood nor can they be satisfied, I give that man a copy of The Book Of Guys for his very own. It's comforting to know that you're not alone. Those who think that this subject matter is too dark need to re-evaluate what happened to their manhood during the woman’s movement in the 70''s and beyond. I call it the Alan Alda syndrome. So get a copy and read it aloud, but not to your wife. When you're done with the book, turn on your TV and watch “For Love of The Game” with Kevin Costner. What the two have in common is a little elusive, but they both seem to effect feminists in the same way. That alone is a good enough reason.